Camping, boating and fishing are popular along the beautiful Muskingum. While the Muskingum River begins at Coshocton, between Zanesville and Marietta it holds many points of interest. This river is the only river navigable by larger boats within the state of Ohio. That’s all because of its system of eleven dams and locks, still in working order, that extends for 112 miles. The Coal Run Ferry delivered a load of railroad crossties on horse-drawn wagons across the Muskingum before bridges were built. The river received its name from the Native Americans, who called it Moos-kin-gung – meaning “Elk Eye River”. That name happened due to the large herds of elk that once roamed this valley. In those early days, the cargo on the river consisted of essentials such as salt, flour, pork and apples. A round trip took three to five weeks to go from Zanesville to Pittsburgh and back via the Muskingum and Ohio Rivers. The steamer approaches Lock #3 at Lowell in the early 1900s. When steamboats became popular, navigation was rough on the rugged Muskingum River so they designed a system of dams and locks to lift the boats when the elevation changed abruptly. After a boat is secured within the lock, the lock tender closes the gate and opens the valves required to raise or lower the pool level. When the water in the lock chamber has reached the required level, the lock tender opens the through gate just like they did in 1841. Steamer Marietta got stuck on the dam when not using the locks. Sometimes the boats would attempt to go over those rugged spots without using the locks. Once in a while they succeeded, but often they ended up stuck in the river. The Lorena takes passengers on a pleasure trip down the Muskingum River. This trip began with a stop at the Lorena Sternwheeler at Zane’s Landing Park in the city of Zanesville. While the original Lorena visited Zanesville in the late 1800s, the present one arrived in 1976 for Zane’s Trace Commemoration. A ride on the sternwheeler gives you a chance to feel the river, as the paddles create a merry sound. Memories of the 1800s ride along with the Lorena. Lock #9 at Philo provides a great view of the dam and locks. Soon Lock 9 at Philo appears with the original lock tender’s house.The falls at the lock sparkle in the sunshine as people stand in the shallow river to fish. The Philo Ohio Power Plant was the first electric plant built along the Muskingum. In 1923, Philo Ohio Power Company, one of the largest electric plants of that time, was located on an island in the river. The lock tender hand operates the lock at Rokeby Lock #8. Lock 8, Rokeby Lock at Eagleport, is a special stop along this system of locks, the only hand operated locks still being used in the United States today. In fact, it is believed there is only one other system like this in the world, and that is in China. It was near this lock that General John Hunt Morgan and several hundred cavalry forded the Muskingum River on his raid across Ohio. Stockport Mill Inn would be a pleasant place to spend an evening. Beside Lock 6 stands the beautiful Stockport Inn. Today’s Inn was built in 1906 by the Dover brothers; however, there were two mills previously at this site dating back to 1842. This mill was known for its refined flours: Gold Bond, Seal of Ohio, and Pride of the Valley. It’s a perfect place to spend a night as each room has a balcony that overlooks the river. On the weekends, enjoy a tasty meal at Restaurant on the Dam. Fishermen wade into the river in hopes of a great catch. Imagine early travelers’ surprise upon seeing that the Muskingum River empties into the wide Ohio River at Marietta. The trip ends at the first permanent settlement in the Northwest Territory – Marietta. Here the Muskingum River joins the Ohio River to flow eventually to the Gulf of Mexico. At the confluence of the Ohio and Muskingum Rivers stands the Lafayette Hotel. Some say this beautiful old Lafayette Hotel still holds spirits of many travelers from the past. One nighttime visitor is Mr. Hoag, former owner of the hotel, who appears in his brown derby hat. That’s something not seen by my eyes, but a story heard by my ears. The locks are open weekends 9:30 – 6:00 from mid May until mid October. Please check their schedule and call ahead if you need to use the locks at another time so a lock tender can be available. While in Marietta, you might want to cruise on the Valley Gem. Be sure to take time to sit along the Ohio River and enjoy reminiscing about those long ago riverboats that went from Pittsburgh to Zanesville along this route. They carried both passengers and freight. Barges still carry their loads of coal and steel up and down the river, and people enjoy taking a ride in their pleasure boats as well. Some things have changed, but the Muskingum River has remained the same since the days of ancient visitors. Hope you can enjoy a trip down the Muskingum River sometime soon. Caution Ghost Crossing! could easily be a sign encountered quite often by members of the Southeastern Ohio Paranormal Investigators. 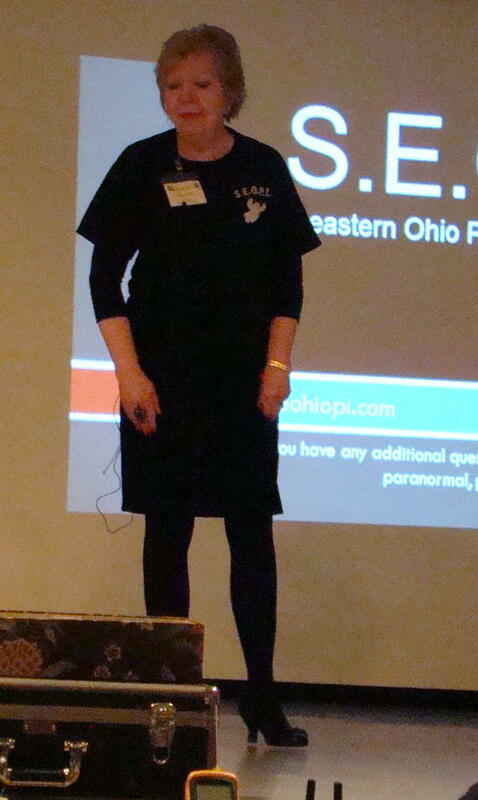 And on a Saturday in February, ghost hunting appeared to be a very popular subject as the auditorium at the John McIntire Library in Zanesville, Ohio was packed with adults seeking to learn more about ghosts. While the curious were gathering, videos of ghost hunts were being shown to whet the appetite. 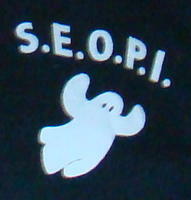 Members of the S.E.O.P.I. were on hand to give information about the technical aspect of ghost hunting, historic research involved, as well as psychic and metaphysical connections. Started four years ago, the S.E.O.P.I. has become a popular source for people who feel they have a ghost on their property, and even for those wanting help getting their ghosts to move on. Tom Robson, lead investigator, said that while they continue to explore all possibilities, “There can’t be an expert in a field with no scientific evidence.” As a youngster, Tom had an experience with the paranormal as well as a deep interest in history. Now he has discovered how the two seem to be closely connected. What started out to be just a part time hobby for him has nearly turned into a full time job. The evidence that has been captured is 90% on audio and only 10% on video. There was a nice display of the instruments used to capture the sounds and pictures at the various haunted establishments. Some of their favorite instruments included: the Olympus digital audio recorder, Zoom H1 microphone, and Zoom H2, which was so powerful they said you could hear raindrops three rooms away. For example, during an Electronic Voice Phenomena (EVP) session on the Triangular Field in Gettysburg, questions were asked of a spirit and there were many responses recorded that were easily understood. Responses were short such as : “Right”, “OK”, or “I know”. When leaving the field, the team said, “Blessings to all,” to which a voice answered, “Thank you.” The recording equipment produces some very interesting results. Historian, Gary Felumlee, presented paranormal research tips, because knowing the time period you are dealing with could be vital for a successful communication. His goal is eventually to show by scientific means that the unusual activity is from the spirit world. 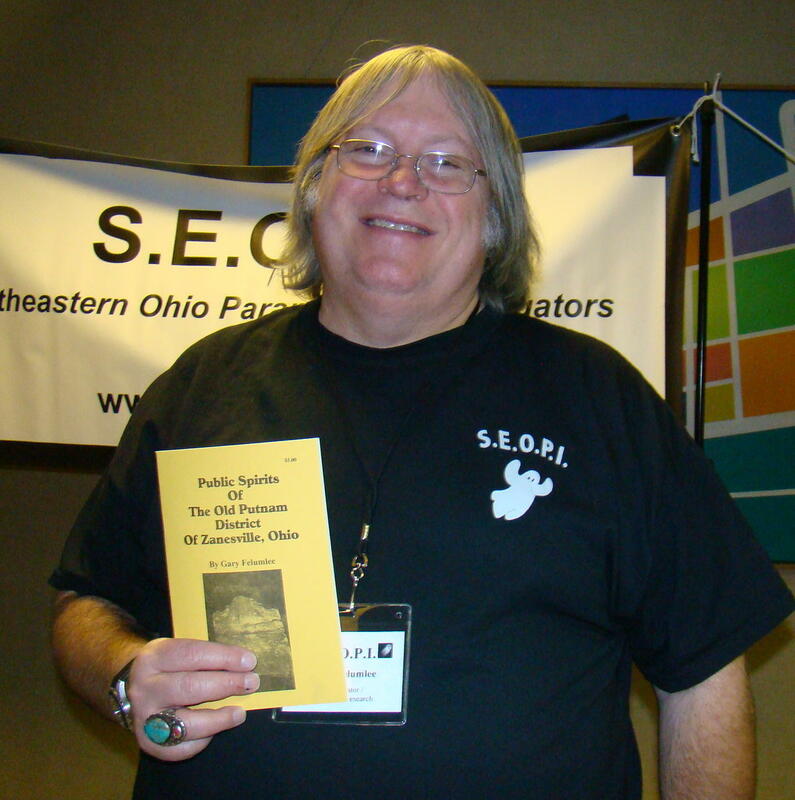 Gary recently wrote about one of these historic paranormal experiences in a book entitled Public Spirits Of The Old Putnam District Of Zanesville Ohio. The metaphysical side of investigations was also covered with April Lovejoy explaining the world of crystals and meditation. Often team members wear particular crystals as protective devices from the spirits. She actually had the entire audience practice five minutes of meditation to learn to focus their mind in one place. This helps, too, when on a paranormal investigation as it permits the team a close connection to the place they are visiting. Well know psychic, Ellen Bone, described an actual investigation where through psychic connection they were able to find the location of the spirit and release it from the residence. Ellen’s natural intuitive qualities were always encouraged by her family where psychic activities were accepted as part of the norm. She believes we are all connected, and does her work with honesty and kindness. Evidence was shared through recordings, photos, and videos. It was surprising how many establishments in the area have had some paranormal activity. They presented information on several places where the S.E.O.P.I. team had been welcomed to investigate. These included many places right here in Ohio: Penny Court, Col. Taylor Bed & Breakfast, and Cambridge Performing Arts Centre in Cambridge; Zak’s Restaurant, Papa Chuck’s Pizza, Zanesville Community Theater, Stone Academy, and Schultz Mansion in Zanesville; Licking County Jail in Newark; and The Captain’s House in Dresden, just to name a few. Door prizes, including gift certificates, tee shirts, books, and pictures were given out throughout the program. To make the prizes extra special, all were donated by businesses where paranormal activity has been a frequent occurrence. What do you think? Have you encountered any ghostly experiences in your world? Time to decide: Believer or Skeptic! 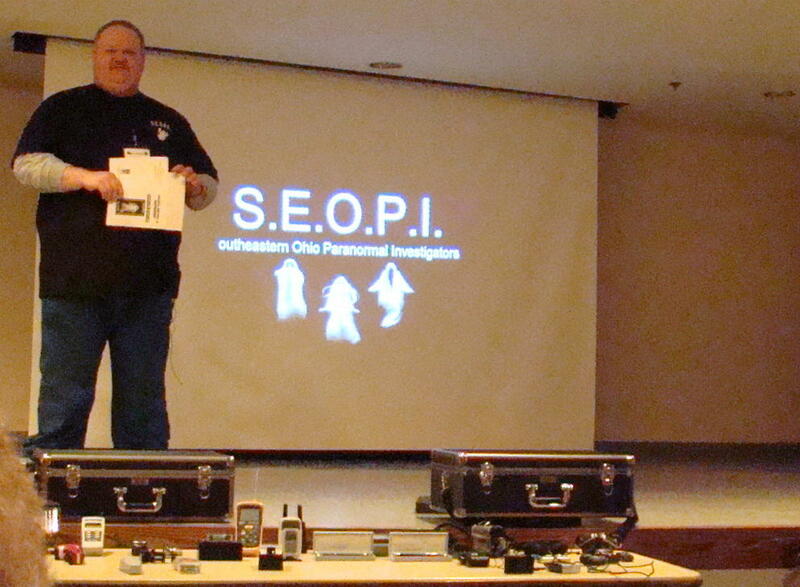 Southeastern Ohio Paranormal Investigators are a select group of researchers from many walks of life. The group is based in Zanesville, Ohio and assists residents and businesses that encounter suspected paranormal activities.